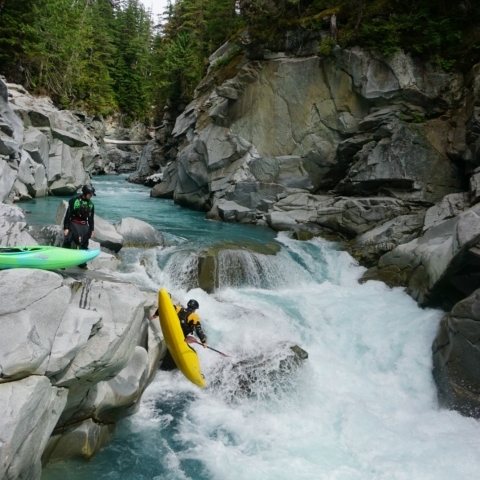 The Stikine is an incredibly powerful river that hordes of kayakers flock to every season. 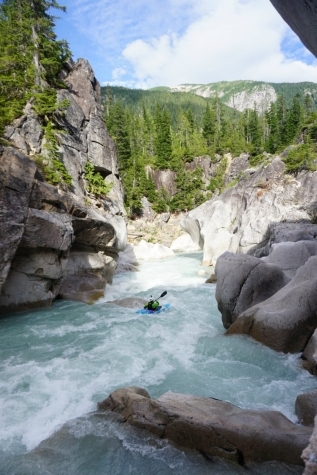 It has become the pinnacle of expedition kayaking and big water. 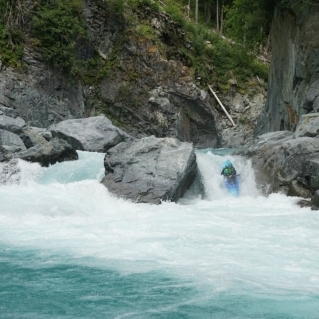 But this story isn’t about the Stikine. In fact, this year, my crew figured it was time for something completely different: The Gamsby. Located deep in the British Columbian bush lays the largest continuous tract of coastal temperate rainforest in the world, the Kitlope Heritage Conservancy. That’s where our expedition began. With 795,700 acres, it’s the largest conservancy of its type. 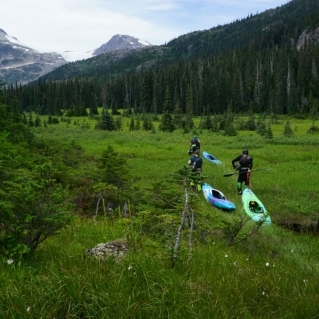 That’s nearly one million freakin’ protected acres in just one little slice of BC! A large industrial extractive resource company owned the Kitlope region until environmentalists lobbied for and designated it as a provincial park in 1996. While the designation allowed smaller industries such as ecotourism to thrive for some years, it prohibited larger, more aggressive industries. Now, the only fuel allowed in the park is the blood and sweat of human power. But to be sure, you’re also going to need a high tolerance for mosquitos, a convincing moose call and bear spray. The density of timber in British Columbia is startling when you find yourself driving north to south through the province. Even more startling is the energy it takes to drag 90 pounds of kayak through it. The forests are thick and black bear and moose sightings along the roadside are common, indicative of the thriving wildlife populations within. I lifted off from the East Coast with my eyes set on the Payette for a few warm-up laps to shake the nursing-life rust off. I had plans to join what seems to have become a mandatory annual pilgrimage north for big-water, class-V paddlers, a status which I barely fit into on my best of days. Unfortunately, after many disparaging phone calls, it seemed that British Columbia’s fuel rich landscape was burning to the ground. Many of its community members faced evacuations due to the rising flames. And then—deserving no legitimate sympathy—there was a large influx of dirtbag paddlers with no river to run. 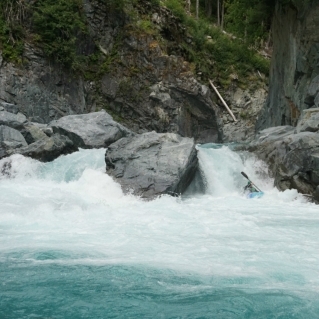 Paddling crews started scrambling, including our crew from Idaho. We hustled to make the epic drive not turn into a mere 36-hour joy ride. 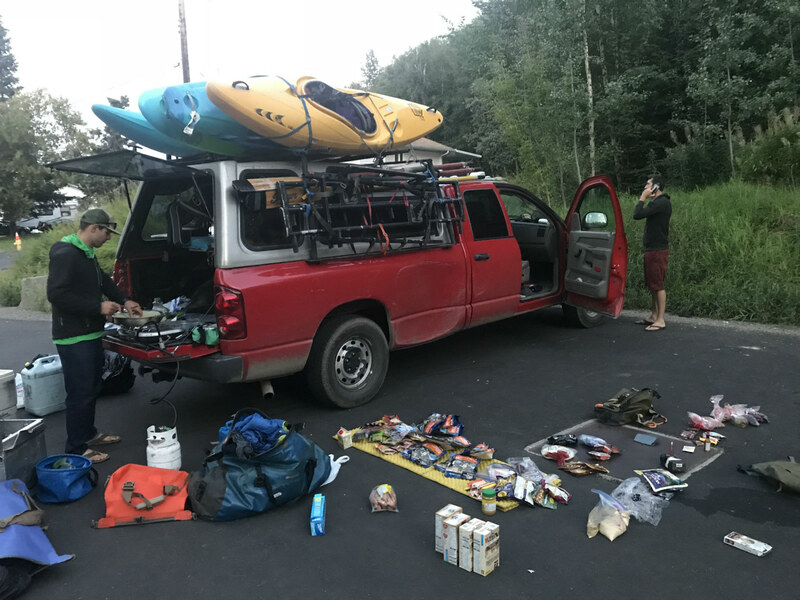 I often feel like my 2002 Tacoma is a perfect size, but after packing Sam’s ‘Big Red’ dodge to the brim with enough paddling and rafting gear to supply a small Yukon expedition, I began to rethink my future vehicle purchases. 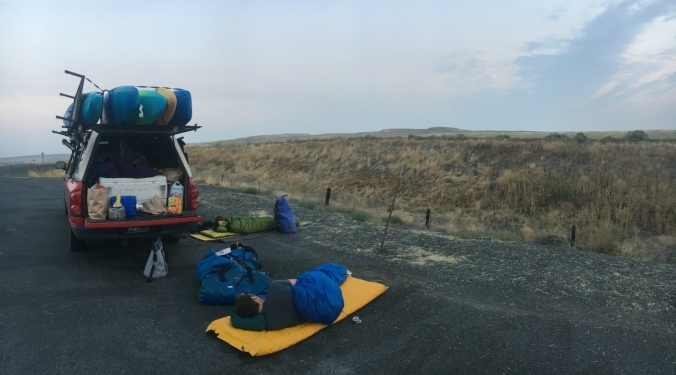 After hours of phone calls from the road, pit-stops for bear spray and to restock our quickly-dwindling gummy-candy supplies (long drives and pre-diabetes behavior seem to go hand in hand with Team Idaho), a quick family visit in Washington and a stop at Werner for a new paddle, we finally made it to the border in the middle of the night with just enough time to catch a quick nap on the side of the highway. We were a third of the way there. 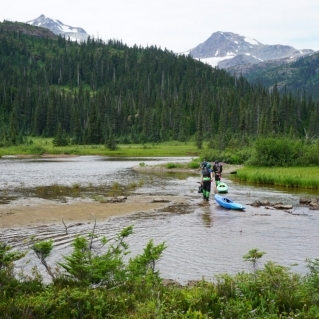 It became very apparent from our road-warrior office space that the Stikine was definitely out of commission. 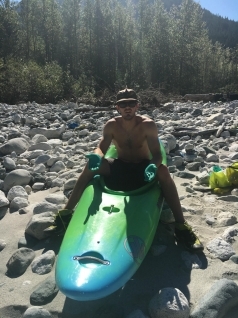 Had I any doubts, the thick Canadian accent on the other end of the telephone letting me know there was no way we were “aboot to paddle dat river. Maybe in aboot a month bud,” put my hopes to bed. Shuffling for another mind-blowing BC experience, we stumbled by luck, along with Mike Bond’s savant-like dueling iPhone skills (one referencing NOAA weather patterns, the other toggling between glacial flows and float plane companies) upon a possible second full-descent of the Gamsby River, first paddled in its entirety just the year before. 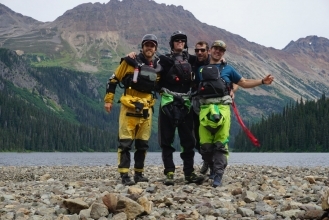 Through the power of social media and Google, we were able to get minimal beta from the first D paddlers, speculate on flows, book a pilot for the flight in, arrange an ocean pickup, and map a hiking route into the park from the last possible access point. As much as I want to shed the burden of technology, it sure is helpful when you’re constantly unprepared and scrambling for a plan B. 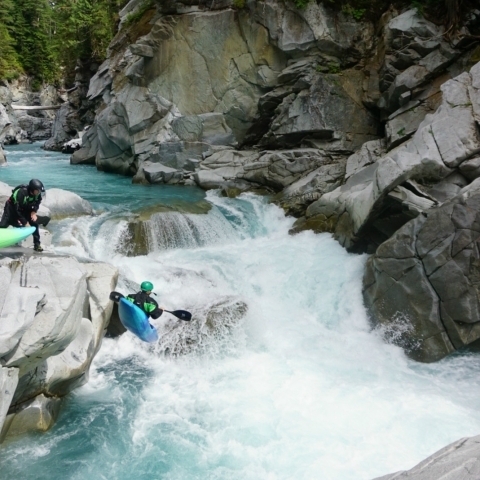 During the first attempted descent of this river in 2001, the team ended up calling in the cavalry and evacuating after flows proceeded to ‘go to 11.’ What could go wrong with such last minute planning? 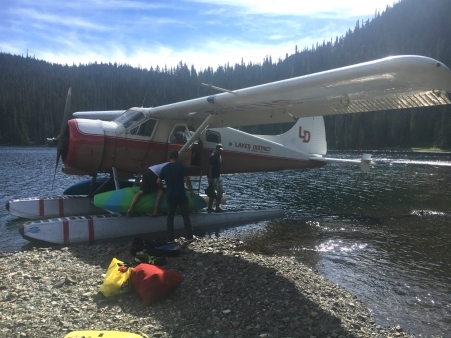 After a long day of driving and parking lot meals met by odd looks from locals—“What do you mean we can’t make stir-fry veggies at the dog park?”—we met our pilots and two float planes. 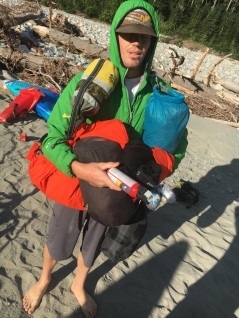 We packed four kayaks and enough food, gear, spare paddles, first aid kits, canisters of bear spray, bug nets, and digital SOS devices to hopefully get us through any scenario that might confront us. The thoughts quickly evaded as the brilliant emerald blue alpine lakes came into view. 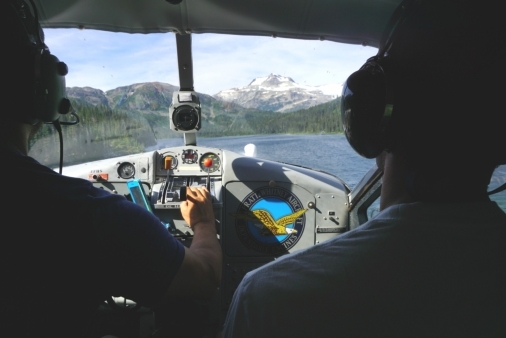 The planes touched down on Cole’s Lake at just over 3,000 feet, and lifted off again in short order. The floats skimmed off the lake leaving us to our own devices. 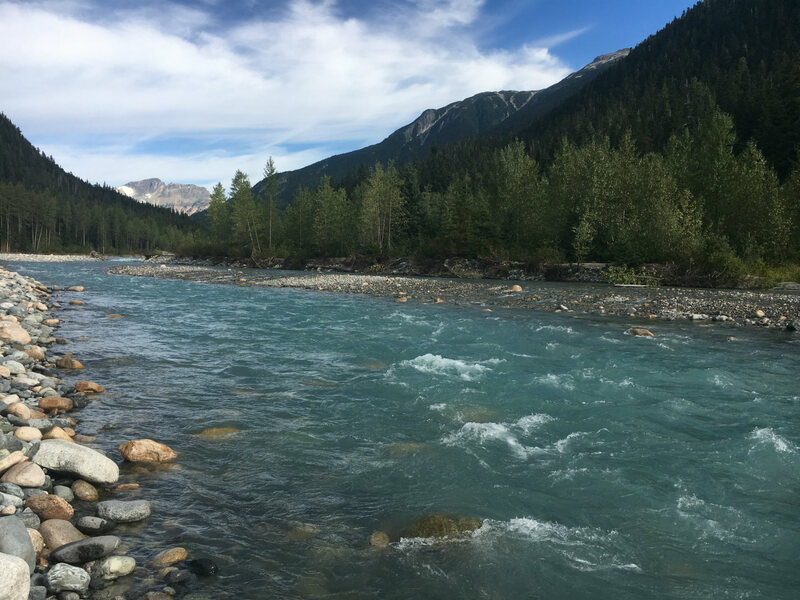 We packed our boats, tied our dry suits around our waists and began the four-five kilometer hike over a relatively small, but thick, pass to the base of a glacier marking the headwaters of the Gamsby. 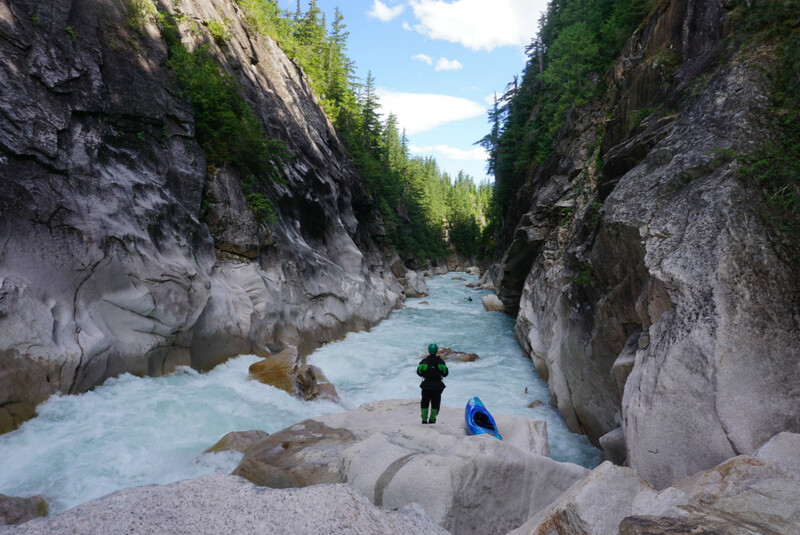 After crossing through an obviously heavily used grizzly thoroughfare, I was happy to slide my kayak into what little glacial flow existed and begin “wheel chairing” my way down the trickle for the next three hours. Then we hit a more significant tributary. 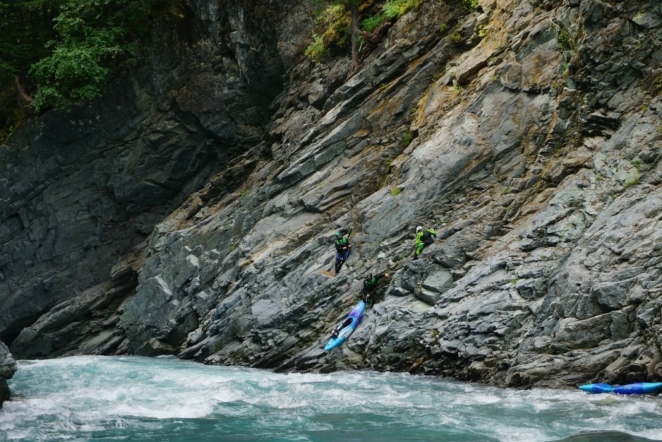 The gorges, with their extreme vertical and the thicket of BC creeping right up to the cliffs’ edges, made for a stunning backdrop to our paddling. 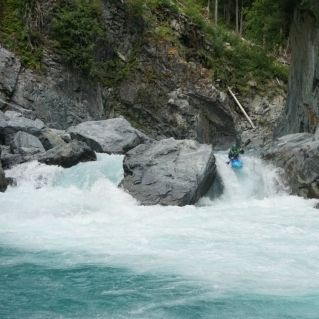 But it also made it extremely difficult to scout downstream around blind corners. 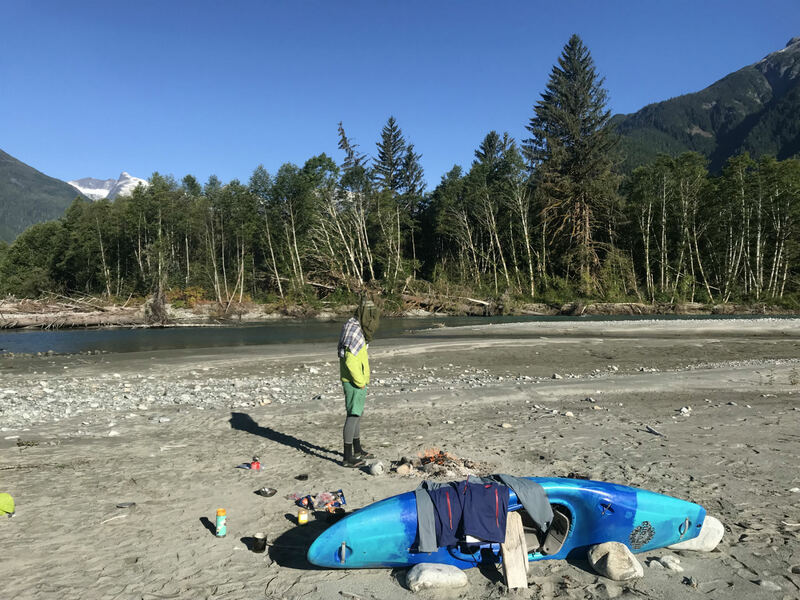 Boat scouting became the best option, but ended with one or two last minute eddy catches, a vertical extraction and a swiftwater crossing back to the other side of the river. 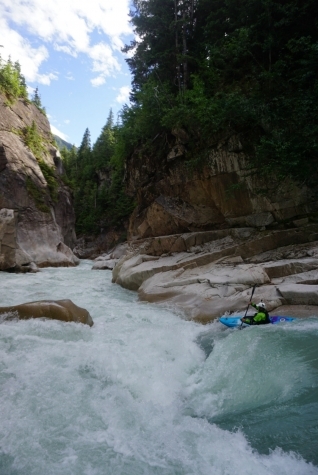 Tributaries snuck up on us faster than ‘last call’ at your favorite bar during Gauley fest. The river constantly gained 25% flow with each creek blasting in from what seemed like solid granite walls. We had been crossing our fingers for higher flows at the base of the glacier until we reached the point where we wondered if we might get too much water. After paddling multiple gorges throughout day one and two, we came to the starkest gorge yet, pronounced by a very obvious portage rapid. Relocate it a couple hundred miles closer to a road with relatively quick-access to a trauma-1 medical center and I might consider running it. 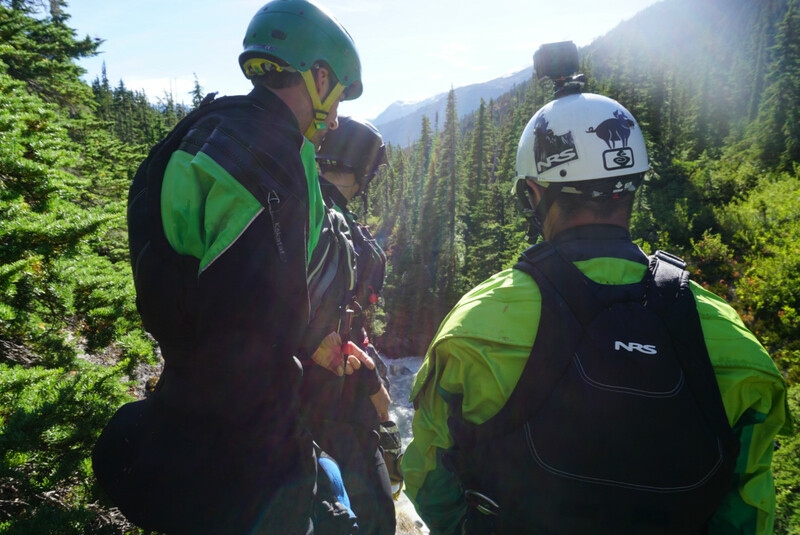 Known exclusively to our crew as, “Bear Spray Gorge,” it holds a special place in our hearts. In our overzealous preparation against a large animal eating us, we had acquired fairly large canisters of high-powered bear spray. Essentially small fire extinguishers filled with super-concentrated capsaicin, the active ingredient in the hottest peppers in the world. “Are your guys’ foreheads on fire?” Sam asked, setting his boat down mid-portage. I looked up. What I assumed could only be blood was streaked across his sweaty forehead and kayak. I began to quickly triage him for signs of a fall, skull trauma, or maybe a laceration gained from the portage. Looking into his boat, I noticed a rust-colored pool of water sloshing around. We all looked at each other, realization dawning on us. Sam’s fire hydrant of pure chemical heat, made to deter a half-ton charging animal, had detonated inside of his kayak after the safety mechanism came dislodged during the portage. 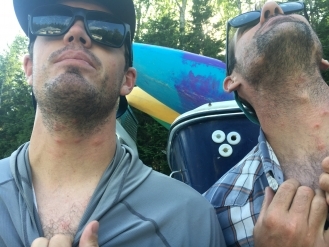 Now the feeling of being smothered in the most powerful hot sauce known to man was beginning to radiate throughout Sam’s forehead, ears and hands, not to forget that it was slightly diluted with water and coating everything inside of his kayak. Unfortunately, the only way to get to the water was to seal launch into a committing gorge that was fairly difficult to scout from above. Not only was Sam on fire, but we had a very rough idea of the lines downstream. 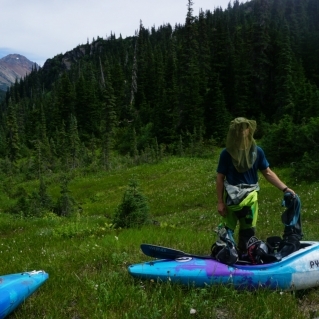 Launching in, we read and ran mostly class IV+ whitewater and caught eddies along the way. The deep burn cooling with every splash. That night, Chris and I dunked and drained the bear spray boat a dozen times and tried to scrub it down with moderate success. Both of our arms would be on fire later that evening and Sam’s wrist gaskets would slowly melt throughout the night, breaking the next day. 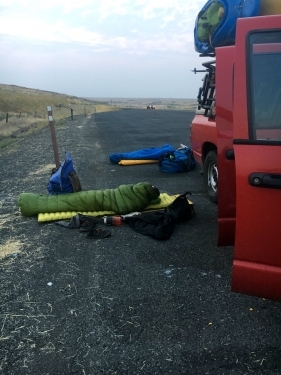 Resorting to the dirtbag field repair, he created a punch-through neck gasket with duct tape and welcomed the sneaker splashes, which slightly alleviated the chemical burns. The personality of the river stayed true throughout the next couple of days. The closer we paddled to the ocean the more waterfalls poured in from every direction. The Gamsby gave up its final gradient terminating at a ‘Salmon Kingdom’: A giant flat pool just below two 10-foot waterfalls filled with thousands of King Salmon barreling their way upstream to their spawning grounds. We chose which waterfall to run by considering which drop was less likely to involve us getting knocked out by 74 pounds of flying salmon. 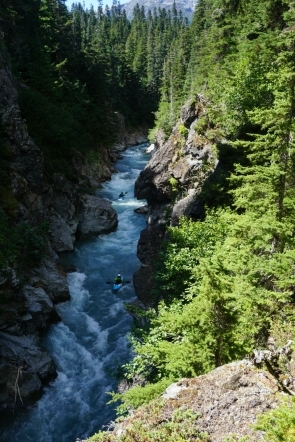 The Kitlope river, a much larger, braided tributary, overtakes the Gamsby. Seals swimming up the Kitlope in pursuit of fresh salmon fillets reminded us just how close we were to the ocean. And the more open landscape provided a better vantage point for grizzlies. We hoped seals tasted better than kayakers. Multiple lack-luster attempts at fishing left us groping underwater for snagged hooks. We left the fishing up to the sea-wolves and bear. 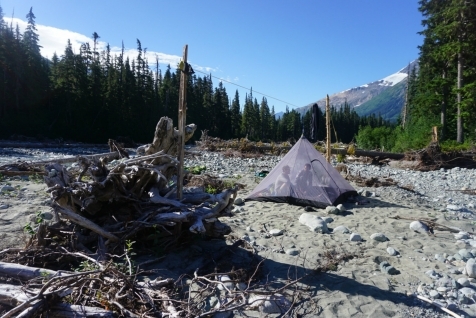 Right at the estuary confluence, we camped on the last—and buggiest—beach of the trip. The next morning as we paddled into brackish waters, we hoped our pre-trip groundwork had been laid properly. Soon, a lone boat came cruising across the glassy water toward us. A Canadian man with a pleasant demeanor greeted us with warm beer, cold pizza and a big smile. 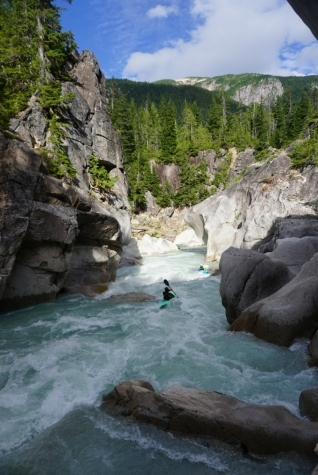 Skimming along the inlet, bordered by gigantic cliffs rising from the water’s edge, was no-less awe-inspiring than the past five days of paddling. I love feeling so small. The captain, hinting at our stench, dropped us off at a hot spring to rinse off while he fished, before proceeding to meet his wife and integrate back into society. 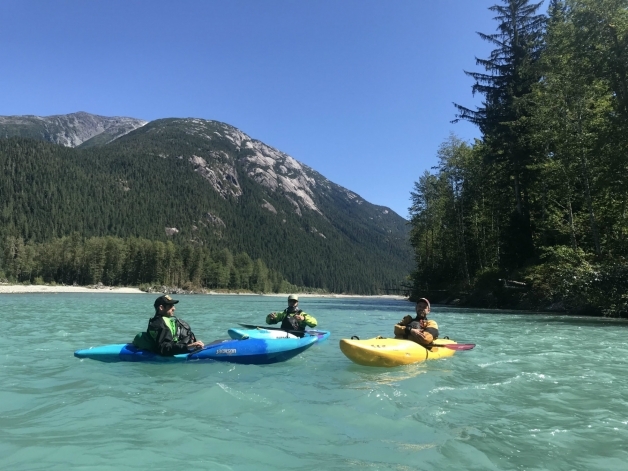 The captain drove us all the way back to Smithers, BC where Mike, Chris and I would fly back to Boise and Boston, and Sam would continue on to paddle BC with a slight burning sensation for the next couple of weeks.